A year and a half ago, a little bar named Harry’s unexpectedly stole our nacho-loving hearts. Coming from out of nowhere, this unassuming place gave us a plate that powered past nearly all of Boston’s nacho behemoths with its delicious flavors and artful distribution. We have since returned many times, but never for the nachos. Why? 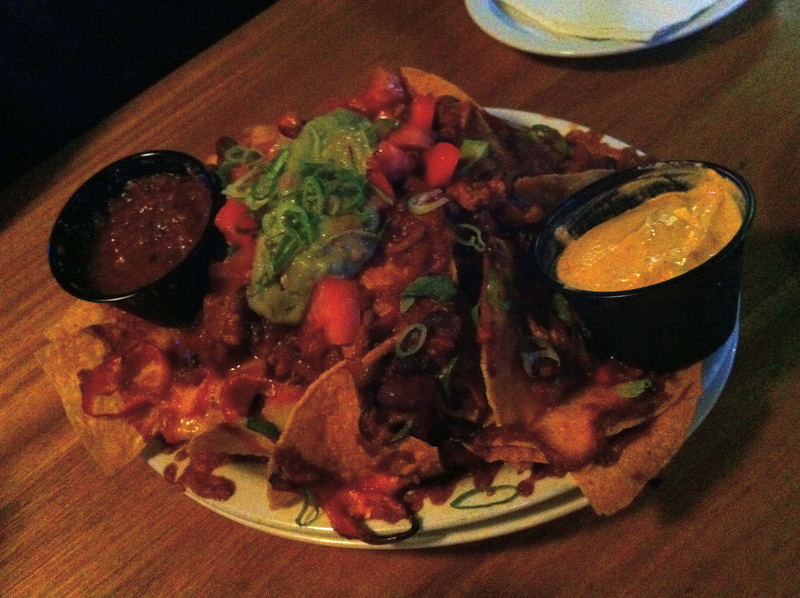 Fear– fear that these were too good to be true, that we were wrong in awarding the silver medal of Boston nachos. Also, we maybe had heard some negative reports. Determined to nut up and do the right thing, we returned to Harry’s on the eve of our departure from the neighborhood, to either confirm their brilliance or set the record straight. Appearance: (8) Much has changed from our original review! Gone are the tri-colored chips, but to more than make up for it, guacamole, green onions and a tantalizingly non-sour cream dip on the side. Chili is now on the top, instead of in the middle under a helmet of cheese. Quality of Ingredients: (9) As could be guessed from their fancied-up color scheme, practically every ingredient in these nachos had changed, generally for the better. The chili had a distinct, chocolaty mole flavor, something we rarely encountered. The orange sauce on the side turned out to be a chipotle cream/mayo concoction, much more exciting that its sour cream predecessor. Even the salsa was miles ahead of the canned stuff of yore– thin, fresh, and reminiscent of both gazpacho and our recent trip to Brighton Beer Garden (perhaps these two are in cahoots?). As before, the chili presented a kidney bean extravaganza, but gone were the black olives. Price: (8.5) What is it with restaurants not having a website? Our blueberry beer-addled brains have failed us. They are only listed without chili, at $7. We’re guestimating on this one. Total: 33.5/40. While they have moved down out of medal contention, we’ll still think of these as winners any day. In an era where restaurants seem to be cheapening and dumbing down their nachos, Harry’s has upped their game with bold, original ingredients. Hurray!